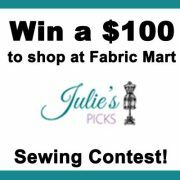 This is a friendly reminder that the Julie's Picks Sewing Contest is fast approaching! Julie's Picks members have one more month to purchase the fabric they can choose to make a garment for the contest. March mailers were sent out on Wednesday, February 27. We created an event on Facebook to get an idea of how many people are planning to attend. Join our event now! Post pictures of your progress and see what others are doing! Remember, Julie's Picks members are the only ones that can be part of this contest. Click here to read the details about the Julie's Picks Contest. We will send out periodic reminders. I can't wait to see what everyone comes up!